Mike introduced me to a Chris Rice song this spring that I can’t get out of my mind. We usually listen to it while we’re driving (granted, usually 55) — but it captures the craziness that we’re about to embrace in the soon-coming future. “Come on Becky let’s go for a ride! Full of souls as important as yours and mine! We’re starting to experience our “last times” with some things already. This past week, I had what will probably be my last cup of coffee with Dory at Barnes & Noble. Our recent Costanzo Family road-trip was the last time to see many of Mike’s family members. Today I saw my co-worker Cecile for perhaps the last time. And this past Sunday, I experienced what will be my last time to take Communion in our home church for a long time. Joining 200+ people around the Lord’s table one last time was a special experience and a precious glimpse of the multitudes that we’ll meet with in heaven. This was especially meaningful to me as I think our church in Japan will probably have under 20 members. I am so excited about starting a new life in Japan, but that doesn’t mean I won’t grieve what we leave behind. So many precious friends — so many wonderful memories. I want to include some pictures of the singles group we’ve spent so much time with over the past couple of years. Coming back from the retreat this weekend, it is fresh in my mind how special the singles group is to us. 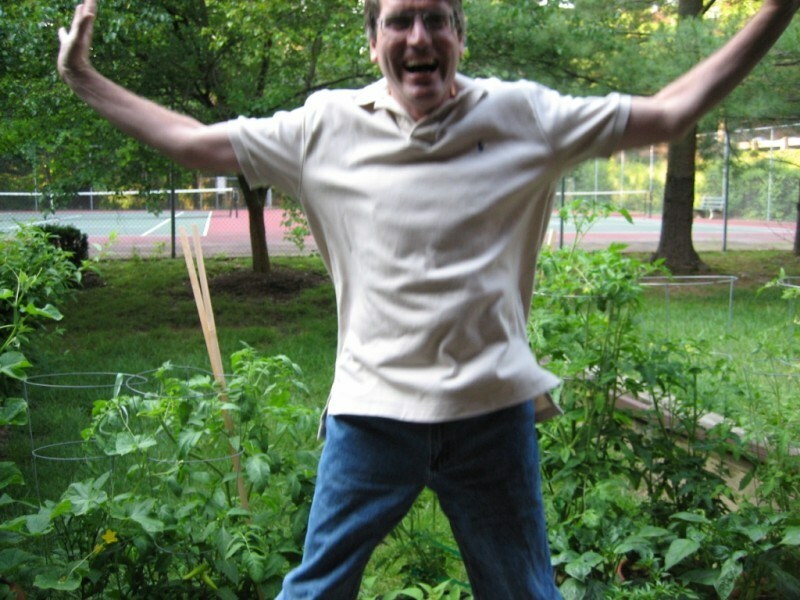 Here’s John rejoicing over the plants in his garden — this picture truly captures John’s passion for gardening! And I love this picture taken at our most recent get-together! Everyone’s faces are beaming — this is how I will remember the singles group!